Our organization is engaged in offering a high performing array of Hydraulic Cylinders Series TMI. These are manufactured using high-grade components and other material that are obtained from authentic vendors. 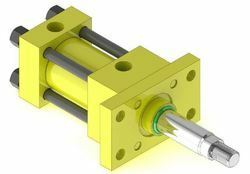 In this range, we include Modular Tie Rod Hydraulic Cylinders, Tie Rod Hydraulic Cylinders. All our products are developed under the supervision of experienced quality inspectors following the norms and guidelines laid down by the industry. We are offering Modular Tie Rod Hydraulic Cylinders to our clients. Internal or External,Reed switch, LVDT on order. Looking for Hydraulic Cylinders ISO 6020-1, TMI, CTS Series ?